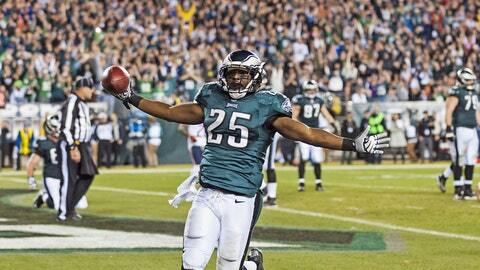 LeSean McCoy is coming off a season in which he led the league in rushing. VENICE, Calif. — After leading the league in rushing attempts (314) and rushing yards (1,607), Eagles running back LeSean McCoy is spending his offseason focusing on remaining durable to play in all 16 games. “I want to be more explosive and in better shape,” McCoy told FOXSports.com on Thursday. “I want to take over more games in the fourth quarter; whether if it’s in the air or on the ground, it’s about being productive and effective at all times. McCoy, who was speaking at the Call of Duty: Ghosts Celebrity Grudge Match, also believes the signing of scatback Darren Sproles will benefit him and the entire offense immensely. Sproles was acquired in a trade via the Saints in March and immediately signed to a two-year extension. “Signing Sproles helps me out as a running back,” McCoy said. “I can go in a game even more fresh because I’m getting less carries and less attempts. I had 366 touches (in 2013), which is a lot. I think me having less attempts can help me be more productive and more deadly. Being fresh in the fourth quarter, things that you don’t think matter really do make a big difference. While the Eagles added a very diverse playmaker in Sproles, they made a stunning move, releasing Pro Bowl wide receiver DeSean Jackson. Despite coming off a year in which Jackson played every regular season game and posted career highs, the team reportedly shopped him around and later abruptly cut him. Since then, he has inked a three-year deal with the Redskins. “I heard the rumors, but I was surprised for sure,” McCoy said. “I mean, he’s probably one of our biggest playmakers that we had. He can make plays at any given time. He can control the game. He’s probably the biggest deep threat in the NFL. To lose a guy like that is definitely tough. He’ll definitely be missed. Obviously every move is made for a reason. After Kelly’s rookie season as a head coach in the league, players are living by his philosophies, even in the offseason. The Eagles sneaked up on plenty of teams last season. They ended up winning the NFC East and made a playoff appearance. The team, according to McCoy, is all in on Kelly.